What a tasty looking, fun set of cupcake covers! Try baking your cupcakes or muffins, and transporting them to a party in this great cupcake carrier. GoGo toppers are a special feature in this Range Kleen 12-Cup Muffin Pan with 12 Cupcases - Assorted. Cupcake pan Allows you to bake and carry in this cupcake carrier. GoGo toppers Offer an attractive display of 6 chocolate frosting on 6 yellow cake cupcasees and 6 pink frosting on 6 chocolate cake cupcases. 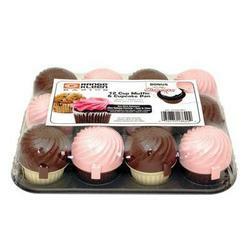 --- Save time and a potential mess with this unique way to transport individual cupcakes.